NEW HAVEN, Conn. -- The New Haven men's lacrosse program has partnered with Team Impact to officially add Isaiah Lamb to the team for the 2017 season. Isaiah, 5, is a quadruplet with cerebral palsy who loves life and enjoys everything it has to offer. 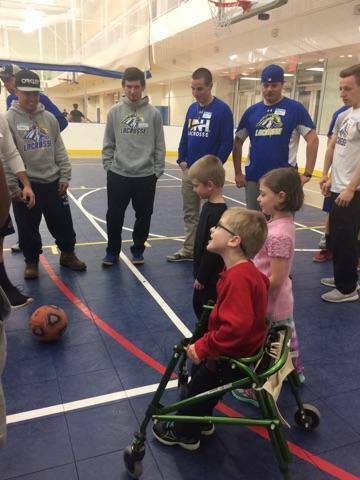 The members of the Charger squad met Isaiah last Friday for the first time along with his brothers Gabriel (8) and Nathaniel (5) as well as sisters Maryann (5) and Isabella (5). The players spent the afternoon playing with Isaiah and his siblings, and even joined in a stirring rendition of Rudolph the Red-Hose Reindoor to mark the holiday season. "We are so honored to be a part of the lacrosse family," said Erin Goodburn Lamb, Isaiah's mom. "We had an amazing time meeting this incredible team and we're looking forward to this journey!" Isaiah will be included in many of New Haven's practices and game preparation throughout the season. He was presented with an official Chargers helmet autographed by every member of the team. Team Impact's mission is to improve the quality of life for children facing life-threatening and chronic illnesses through the power of team.